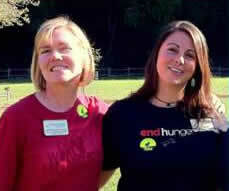 On March 1st, Eliza passed the Northern California "coordinator hat" to wonderful & talented Jill Kilty Newburn. Jill has worked for Heifer's Education department for over five years, most recently as the Learning Center Director at our partnership farm, Hidden Villa, where her office is located. As we seek to be more strategic & efficient, Eliza will focus in on the greater Seattle area & Jill on the San Francisco Bay Area. Hooray for California having a coordinator in the state! 0 Response to "Coordinator Hat"